I want to share with you some surprising little Norwex cleaning tips for your kitchen today. These tips are super effective, but could be labelled as ‘lazy’ because they make the job SO EASY compared to what most people do. You know how some days, you are just struck with a desire to ‘CLEAN ALL THE THINGS?’ If only we felt that way everyday!!!! I was struck with one of those feelings today, and I wiped down things in my kitchen that are either rarely, or never, cleaned! 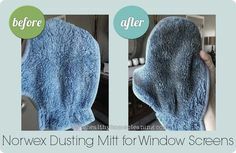 My cleaning frenzy reminded me that not everyone is aware of some of the cleaning hacks that can be used with their Norwex, and that I needed to make sure to share them with you! These hacks are the best because they’re not only a safer alternative to standard harsh cleaners, but they are so gosh darn easy! Don’t just limit your Kitchen Cloth to wiping down your counter and table. This cloth can be used wipe down so many surfaces when you clean your kitchen, with just water! I love using this to wipe off the sticky cupboards and handles when I’m on a roll. This includes the fridge handle (why is it always so sticky!?). I also love giving a shelf or two inside the fridge a quick wipe, when I’m putting away groceries. Today however, I used my Kitchen Cloth to wipe out the inside of the dishwasher door that always gets covered in food spatter. It was quick and easy, and I thought, ‘WHY don’t I do this more often?’ We’ll never know, I guess!! I also ran the Kitchen Cloth along the bottom inside edge of the door. I rarely clean this out, mostly because it’s a spot that you don’t ‘see’ the dirt. But cleaning this spot out is really helpful maintenance that helps your dishwasher clean more effectively. And you only need a damp Kitchen Cloth to get it cleaned well! Simply put some warm water in your sink, so you can rinse it out well in between wipes, as it’s quite slimy ;). You can keep using the same cloth as you go, if you’re rinsing in between! This was also a good opportunity for me to wipe down the outside of all of my appliances. You can use your damp Kitchen Cloth to wipe down the fronts of your appliances on a daily basis to avoid nasty buildup. But if you don’t do it on a regular basis, the Kitchen Cloth can handle the nasty buildup too! The Kitchen Cloth will also work effectively on your Stainless Steel. Some people find that a quick follow up with a dry Window Cloth eliminates any possible streaks for a nice shine! The Descscaler is meant for cleaning the tub and shower, as it cleans off soap scum, limescale and rust. But you probably have rust in other areas that could use cleaning, right? Maybe there’s some on or around your stainless steel kitchen sink? Or maybe, like me, you have some rust in the bottom of your dishwasher from a mason jar lid insert, that was sitting in the bottom for a few days? Simply spray it on the rusty surface, let sit for 10 minutes, then wipe. I used a Spirisponge to add a little extra ‘scrub’ to my efforts, since my rust ring was pretty old! It was literally three quick scrubs, and it was gone. I know this sounds crazy! 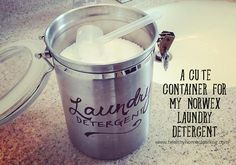 But the Norwex Laundry Detergent is NOT just for laundry. This detergent has so many ‘other’ uses. I used this today to clean the filters above my stove, and a filter that’s in the top of my range hood microwave. I recently used it to clean the greasy oven knobs I can never seem to wipe completely clean. These items were all cleaned simply by soaking in hot water mixed with a generous scoop of the detergent. You leave it, walk away, and a few hours later, it’s clean. You don’t even need to scrub. Does it get any better than this?! Again, this is an effective cleaner that is not harsh. No strong odours. Not hard on your skin. Don’t have to keep it locked away up high. You can also keep some of this detergent diluted with water in a spray bottle and spray down greasy surfaces in the kitchen (like cupboard doors or ledges in the kitchen). It’s also great for spot cleaning carpet or furniture stains (just spot test first)! I’ve used it for deep cleaning my stainless steel appliances. You can also use it for cleaning your car upholstery and mats. It’s seriously the BEST to have kickin’ around for these jobs. I mean, it’s amazing to have around for your laundry too, but don’t just keep it limited to your laundry! If you don’t have these products in your home, you can get your hands on them at my shop, and tackle your hearts’ cleaning desires! Norwex is so good for multi-purpose use! I would never have imagined using bathroom cleaner or laundry detergent while cleaning the kitchen, but Norwex is a game changer! I use our powder laundry detergent for SO MANY things. It’s amazing!